A Senate deadline has passed without a budget deal due to the current impasse on Obamacare. The US federal government is officially "shut down", though this will not send either American troops or the White House chefs home. Obamacare itself has sputtered into effect. There have been 17 such shutdowns in US history. It's a pain for international travel and national parks, but the long-term effects of these events is basically zero in the big picture for anyone not employed by Leviathan. The Republicans furiously want to compromise (as usual -- the only things they don't compromise on are issues not in question). The Democrats will not allow a single alteration to Obamacare that they didn't think of first. The "shutdown" is a hissy fit with no teeth. As a libertarian I actually feel safer while DC is on vacation. Here is the US Sibley chart with the transits for the approximate time of the "shutdown". Transiting North Node and Saturn quincunx US Uranus on the Descendant (ruler of 3rd): Struggles with communication with adversaries, who are impulsively asserting their will. Obama recently lost a public match against Syria and Putin. This is him, petulantly reasserting his manhood. It's really all very childish, especially with Obamacare's infrastructure continuing to fray in public view. With his obliterated natal Pallas, Obama really has no clue about how to pick his battles. Transiting Sun trine US Uranus: Impulsiveness, again. Transiting Neptune and Mercury trine US Venus: Confused communication regarding finances and debt. Transiting Pallas conjunct US North Node: Authoritarian tendencies temporarily curtailed. 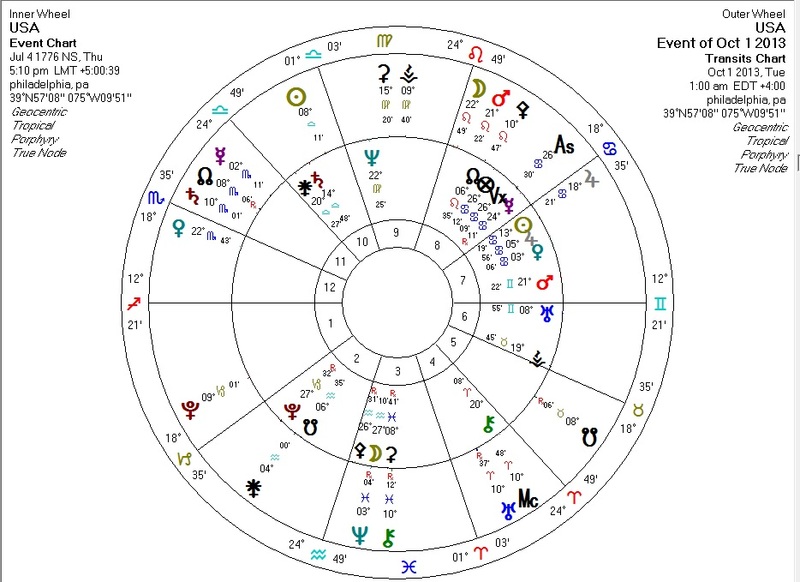 Transiting Mars trine US Chiron in the 4th: Wounded opposition party, lashing out. Could apply to both parties, but the Democrats seem more wounded of late. Venus quincunx Mars in the 7th (ruling 5th and 12th): Opposition regarding money (some of which is hidden from view). A nice little vacation and/or payoff for some. In the long term, none of this is a very big deal, unless the Republicans actually win concessions on Obamacare. The Republicans usually fold and give in to the Left, but they seem to have a fair amount of public support for this battle. Holding one's breath is not advised, but maybe they'll surprise us this time.